"Engrossing, hilarious, and tender... I couldn't put it down." Introducing the Kesslers: Marty, a retired LA film producer whose self-worth has been eroded by age and a late-in-life passion for opioids; his daughter Janine, former child star suffering the aftereffects of a life in the public eye; and granddaughter Hailey, the "less-than" twin sister, whose inferiority complex takes a most unexpected turn. Nearly six thousand miles away, in London, celebrated author Bunny Small, Marty's long-forgotten first wife, has her own problems: a "preposterous" case of writer's block, a monstrous drinking habit, and a son who has fled halfway around the world to escape her. When Marty's pill-popping gets out of hand and Bunny's boozing reaches crisis proportions, a perfect storm of dysfunction brings them all together at Directions, Malibu's most exclusive and absurd rehab center. But for all their failings, the members of this estranged--and strange--family love each other. Rich with warmth, humor, and deep insight, There's a Word for That is a comic ode to surviving the people closest to us, navigating the perils of success, and taking one last look in the rearview mirror before mapping out the road ahead. 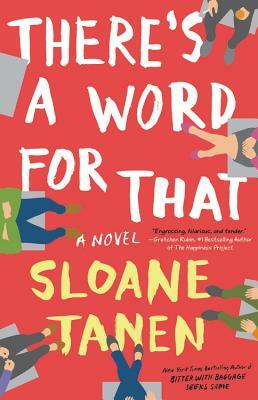 Sloane Tanen is the author of nine illustrated and YA books, including the bestseller Bitter With Baggage Seeks Same: The Life and Time of Some Chickens and Hatched: The Big Push from Pregnancy to Motherhood. This is her first adult novel. Tanen graduated from Sarah Lawrence College and holds Masters degrees from both NYU and Columbia University. She lives in the Bay Area with her husband, the writer Gary Taubes, and their two sons.